We believe that we have the best Christmas light display in New York. Come on out and enjoy our 2018 Computerized Christmas light and music display and discover it for yourself and your family. This year we have over 10,000 lights on 144 channels synchronized to music. This will be our tenth year of using computer controlled lights and we hope to expand it more every year. There are four homes as part of the show this year. 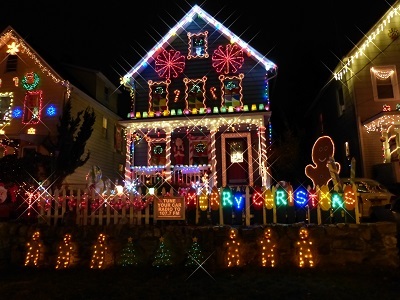 Are you visiting Westchester's Winter Wonderland this season? We're only 3.1 miles and 9 minutes away. The best part is that unlike the Westchester Winter Wonderland - we're free! The Show may be shut down due to rain or wet snow for safety reasons.